Sometimes things happen that take you by surprise. Ideas spring from the simplest, most inane situations, and you find yourself with beautiful serendipity. I’m teasing something new here. Something we cooked up on accident, but I want to share the whole story before the reveal. The scene is a day like any other. Myself, BJ Smythe (a friend and co-conspirator at the shop), and my lovely Ashley were at the shop working on setting out books for new comic book day. A typo on the subscription list left BJ mumbling a perverted (not the sexual connotation of the word!) version of a hero name we all know and love. He kept saying it over and over and it was putting a funny image in my head (again, not sexual you sickos!). That image, when shared with the group lead to a lot of giggling. Which lead to a lot of expounding on the image and what it could mean. The word was supposed to be Spider-Man. Easy enough, but it was written out as Spideer-man. Yes, Spy-DeerMan is what we heard and of course the mental image is amusing. Bond with antlers? 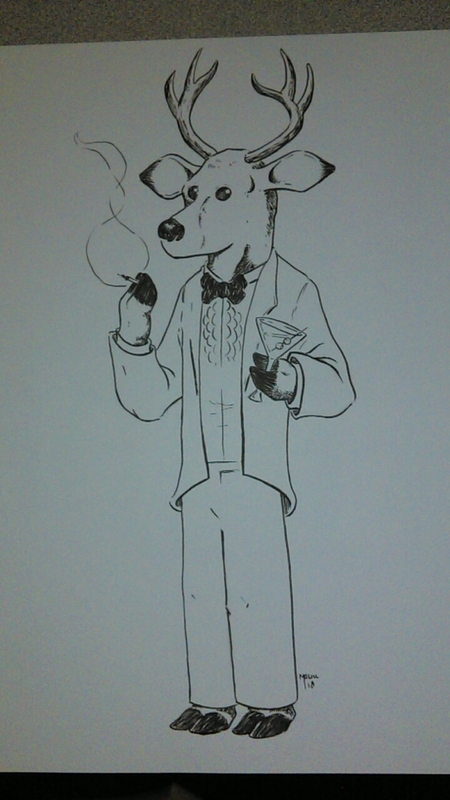 What would this deer, who happens to be a spy, and walks upright like a man’s story be? Johnathan Buck III (JB3) is an international (Spy-Deer)Man of mystery and intrigue and soon will be coming to his own comicstrip for your enjoyment. Spy-DeerMan will be on the scene soon. We’ll be sharing his life, stories, loves, fears, and what makes him tick. Be on the lookout for Spy-DeerMan! I somehow missed this being reviewed almost a month ago (ack). Thank you for taking the time Hunter! Year One: Part Ten – It’s in the can…or do you prefer, that’s a wrap! Welcome to the tenth installment of Year One – you can access the previous entries right here! This post is coming right around the 15-month mark since I released Shady Place. A lot has happened in my life since I decided to drop the counter-productive title “aspiring writer” and embrace the fact that you either are a writer or you aren’t. I’ve written a novel and I’m working on a second and third. I’ve completed 3 issues of my comic book, 4 is written and issue 1 of my next book has a completed script. I’ve spent the last 15 months learning more about the business and promoting, meeting new people, schlocking my wares, going to events and conventions, and doing anyt and everything I can to generally improve my footprint in the entertainment world. I haven’t done everything right. I’ve done some things really right, specifically not compromising on quality at any turn. I’d rather not show you anything if it’s not good (perfect is unrealistic, good is not). I really like what I’m doing. I LOVE what I’m doing. I really do. Do I wish every day it was my full-time job and enough to support my family? Of course. That’s the future, and hopefully, not too distant, but I’m working towards it every day. I regret nothing, and I would do it all again. I’m tired. I have a lot on my plate, but I’m happy with the way things have progressed. Shady Place will be a series. The Couch is going into production on issue #4. Amara is half written. And I have numerous other comic projects and novels on the docket. The only way to accomplish anything is to actually do it. I’m happy to answer any questions I can, find me via the website or social media and please follow along on this journey as things heat up.